This week’s Friday Field Foto highlights an iconic natural landmark – Table Mountain in Cape Town, South Africa. Last April I took a trip to this region to look at some Permian sedimentary rocks. We had about a day in Cape Town before heading north to the field area and spent a nice afternoon trying not to sleep (jet lag) and taking in the sites of the city. Unfortunately, we didn’t have time to get to the top to take in the breathtaking views. 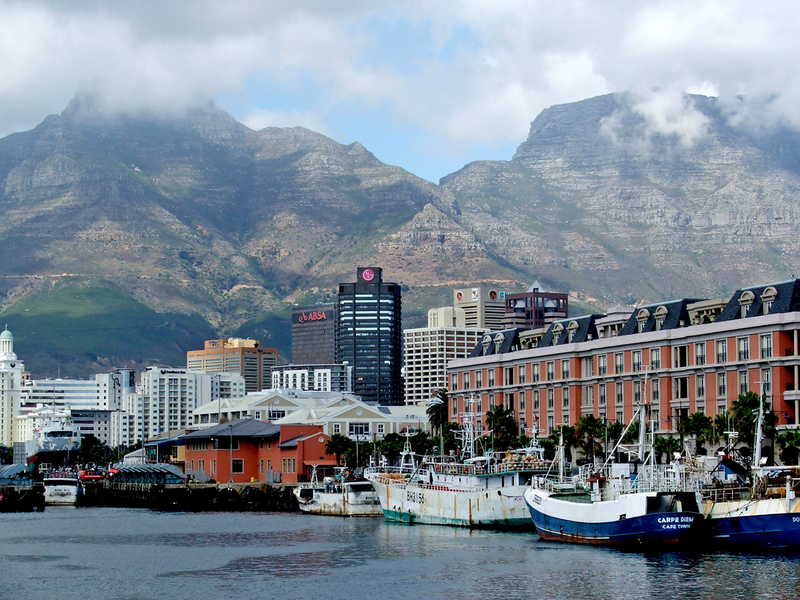 This view of the looming flat-topped mountain, called Table Mountain, is from the main tourist area along the waterfront (we went to a great Portuguese restaurant!). I’m sure Christie at the Cape can provide much more detail about the geology of this mountain. If I remember, the prominent gray layered rocks in the upper half of the mountain are part of the Ordovician (443-488 million years old) Table Mountain Sandstone. Below that (again, if I remember correctly) is Precambrian metamorphic rocks that is intruded, in places, by granite. Aha. Thank you for the link to that post on internet cranks (hilarious by the way). That is exactly what they do over at OIM. I don’t want to be an internet crank, I’m better than that. The funny thing is that they were following every one of those strategies exactly over at OIM. Perhaps the best way to combat crankery is to combat crankery, and not go after them personally though. Hahaha, those tactics are funny still, it’s beyond me why anybody would want to lie to get published unless they are in it for scamming. I get that now. Science doesn’t work that way anyhow, at least I hope it doesn’t, but I guess it sort of does. There are cranks in physics as much as there are cranks in geology. I wonder if Roger Penrose’s Twistor Theory is a crank, the math works but perhaps the experimental physics doesn’t. Anybody else going to be in town? Send me an email! The basement in the western cape is a large accumulation of turbidites with detrital ages in the 700-550Ma range. I suspect them to be an accretionary wedge but there is not broad agreement on that. They were intruded at 550Ma by a linear string of small granitic batholiths – early S-type transitioning to I-type. These were rapidly uplifted and eroded (some rocks appear to have cobbles of the granites even while representing the youngest age of the turbidite units). Ridge-trench interaction anyone? Just sayin’. The unconformity represents about 100My. On Table Mountain there is a thin red braided fluvial sequence (the Graafwater Fm) which gives way upsection to the Peninsula Sandstones as Brian mentioned. The Graafwater has some trace fossils (cruziana and some burrows of various sorts) but the Peninsula is pretty barren. It’s 98% SiO2. christie … I’m not going to the Cape Town meeting … wish I was, a bunch of colleagues are going. Looks like it will be fun. thanks for your comments on the geology!